Please click on photos for enlargement. Spectacular scenery at Lake Karakul, located 12,000 ft above sea level. Photo: Ali Karim. Copyright. 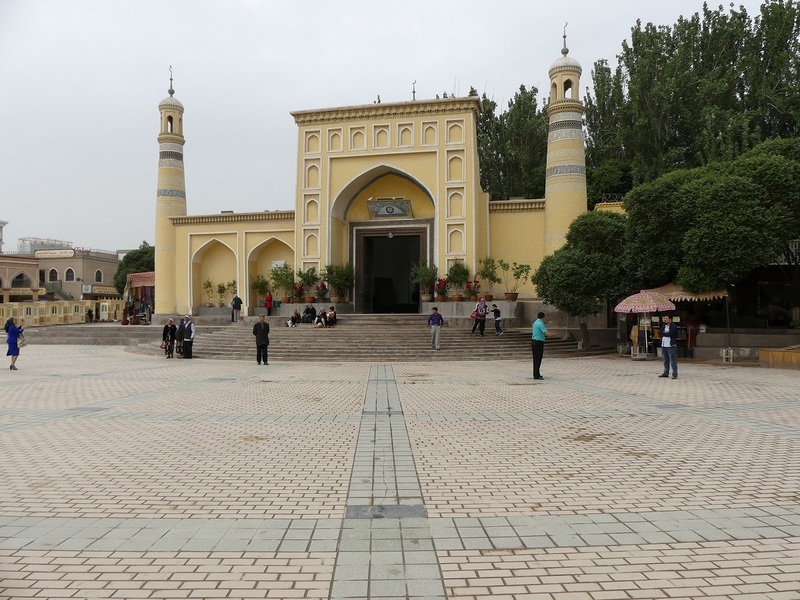 In this third piece of my multi-part travelogue on the Silk Road, I complete our visit to Kashgar with more photos of the Id Kah mosque, as well photos of “old” old Kashgar and the bustling Grand Bazaar. 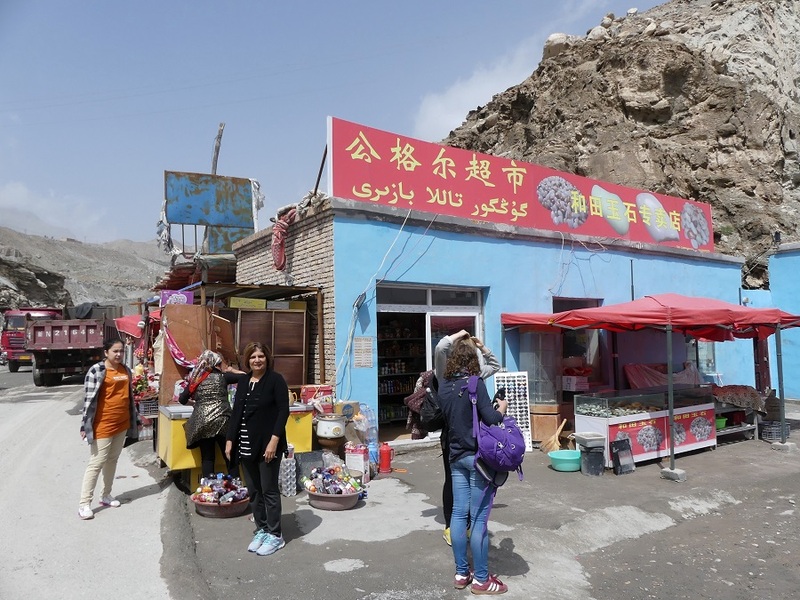 Then from Kashgar, which lies at an altitude of 1270 metres (4,170 ft), Dilshad and I were driven 300 kms along an incredibly scenic road to the town of Tashkurgan, which is at an altitude of around 10,000 ft. Our three-and-a-half-week trip to the Silk Road was fabulous and we highly recommend that everyone do this trip if they can. Please feel free to write to me by contacting the editor of this blog at Simerg@aol.com or by becoming my Facebook friend at https://www.facebook.com/ali.karim.10485. 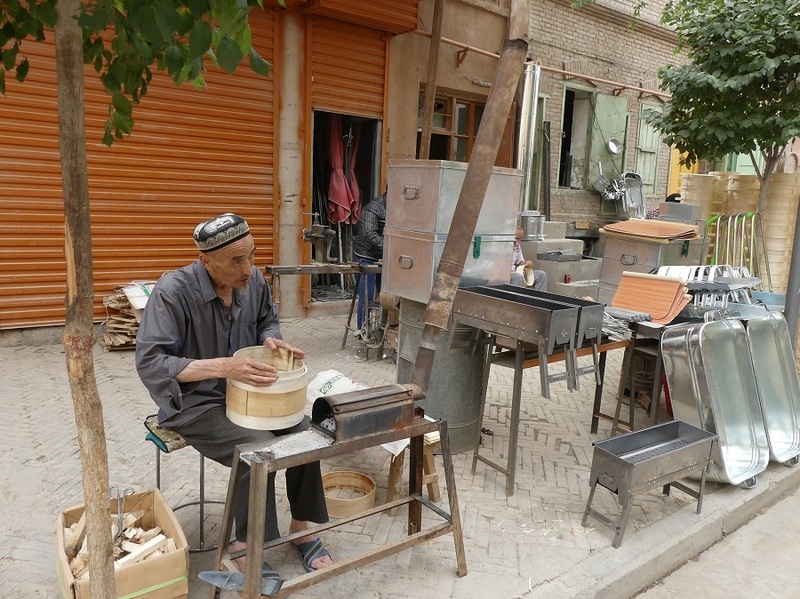 (If you missed the first two installments of this series, please read them at Silk Road Travelogue by Ali Karim: (1) Shanghai, Urumqi and Turpan and Silk Road Travelogue by Ali Karim: (2) More of Turpan and Historic Kashgar). 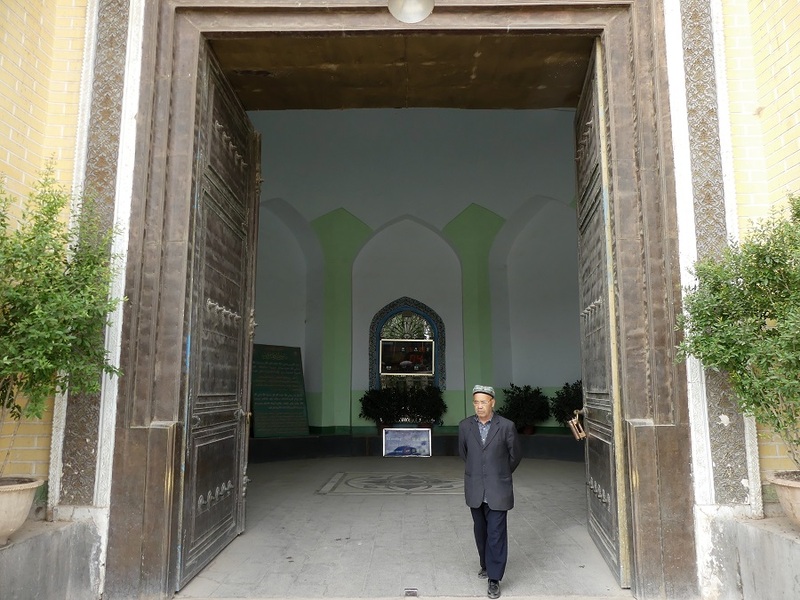 A plaque documenting the history of the Id Kah mosque in Kashgar. Photo: Ali Karim. Copyright. The previous installment carried a few photos of the Id Kah mosque. 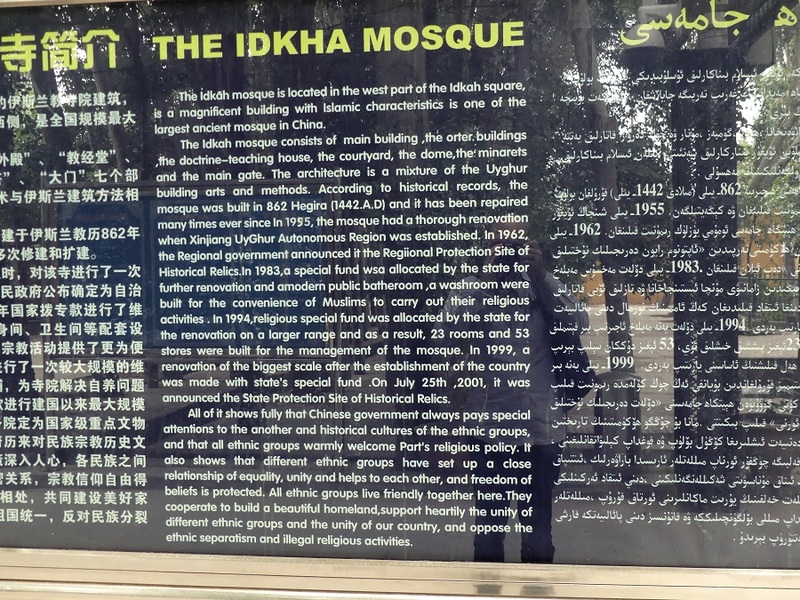 I am producing some more on this page, including the plaque shown above that explains some of the features of the mosque and propagates the idea that different faiths and cultures are allowed to practice and co-exist freely in China. Interior entrance which leads to the actual mosque. Photo: Ali Karim. Copyright. The Id Kha mosque was built in 1442 and has been repaired/renovated and fixed up many times over the years. The mosque building itself is small, with the interior capable of handling several hundred worshippers; but the grounds of the mosque are huge, and mats get rolled out to allow thousands to pray in the nicely shaded courtyard areas. An internal courtyard of the Id Kah mosque. Photo: Ali Karim. Copyright. 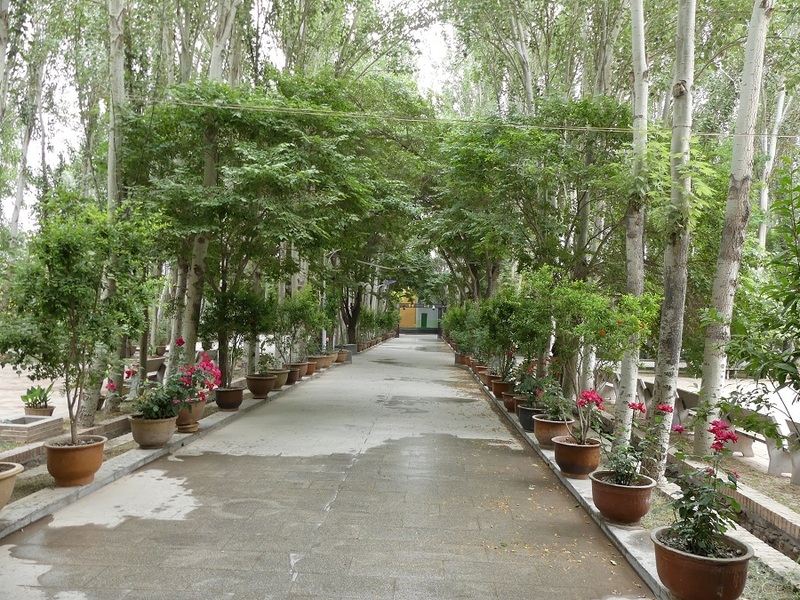 The lovely grounds of the Id Kah mosque. Photo: Ali Karim. Copyright. 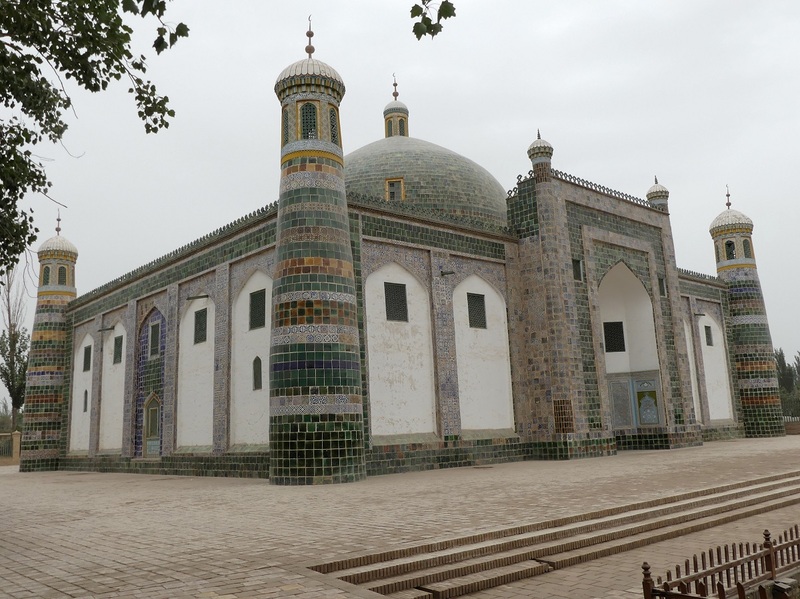 The mosque used to have madrassas, but now they do not as the Chinese Government does not allow this anymore. Outside, at the entrance to the mosque, is also a huge open area where people can pray. This is a a very peaceful and a nice place to visit. Id Kah mosque and the huge square in front of it. Photo: Ali Karim. Copyright. A close-up photo of the huge portal entrance doors of the Id Kah mosque. Photo: Ali Karim. Copyright. 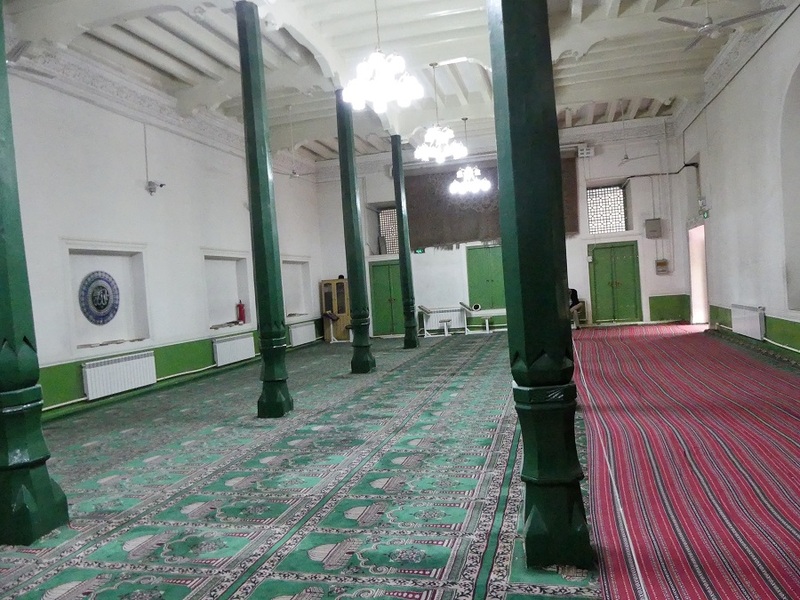 The main prayer hall. This can accommodate several hundred worshippers. The outdoor courtyard spaces hold several thousands faithfuls. Photo: Ali Karim. Copyright. After the mosque, I decided to go for my obligatory haircut. The barbers close crop the hair in Uyghur land, so my next trip to a salon would be some 6 weeks away. The $1.50 price for the hair-cut, without even bargaining, was a steal! We then visited the Akbah Khoja Tomb Mausoleum. Khoja was a famously infamous person. He had a large Muslim following, but he ran afoul of the local Uyghur king, and so was banished. He fled to neighboring Tibet, and convinced the king there that he could help him conquer Uyghur land, with the help of his loyal followers there. So the Tibetans conquered the Uyghur kingdom and Akbah Khoja came back again as an infamous individual for the Uyghurs. Akbah Khoja tomb mausoleum with 72 members of his family buried inside. Photo: Ali Karim. Copyright. The mausoleum is where he and his multiple family members are buried. Outside this area, is a huge cemetery with hundreds of people buried there to be near this man. There are also madrassas and a mosque on these grounds. 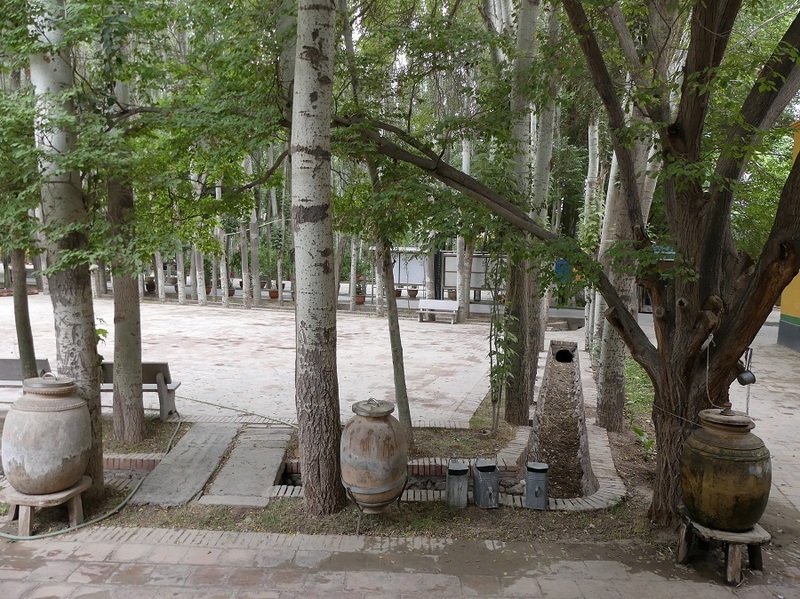 This is also reputed to be the resting place of the “fragrant concubine” who was actually the Uyghur wife of a Chinese dynasty king. The marriage was arranged for keeping good relations with the Uyghurs. 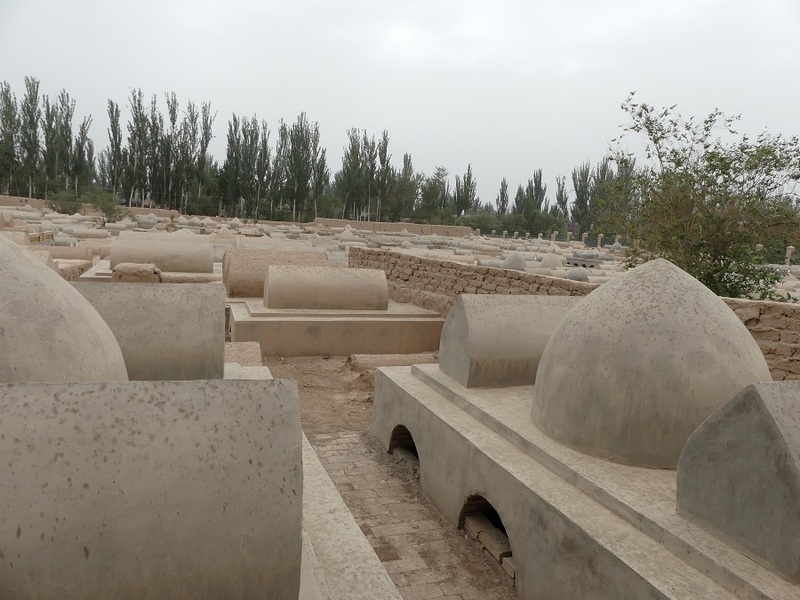 Huge graveyard outside the mausoleum where Akbah Khoja’s followers wanted to be buried. Photo: Ali Karim. Copyright. 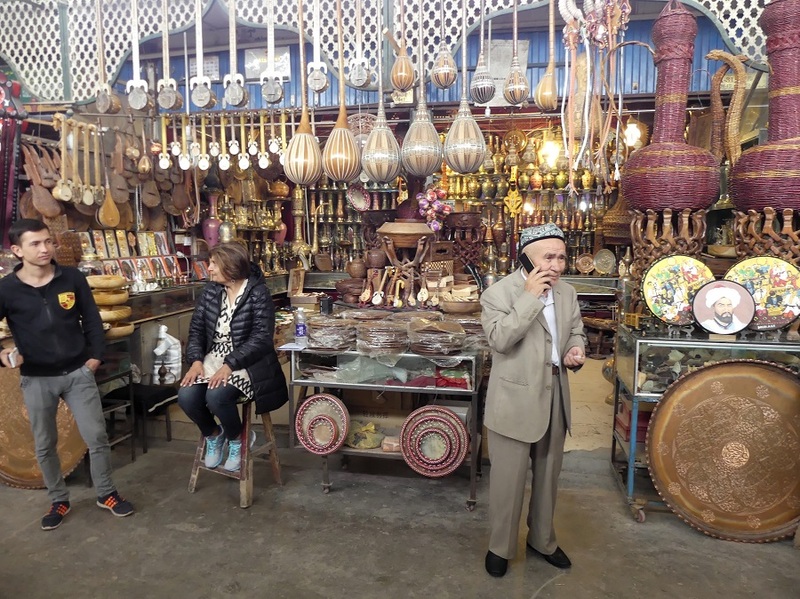 We also visited the Grand Bazaar where we got our Uyghur hat souvenirs and bought dried fruits and nuts for our journeys ahead. There were plenty of dried/roasted apricot seeds here, which surprisingly were not at all bitter. Food stalls outside the Grand Bazaar. Photo: Ali Karim. Copyright. More food stalls outside the Grand Bazaar. Photo: Ali Karim. Copyright. The Grand Bazaar building. Photo: Ali Karim. Copyright. A stall in the Grand Bazaar. Photo: Ali Karim. Copyright. For lunch, we went to a Pakistani restaurant, hoping to meet some Tajiki Ismailis. 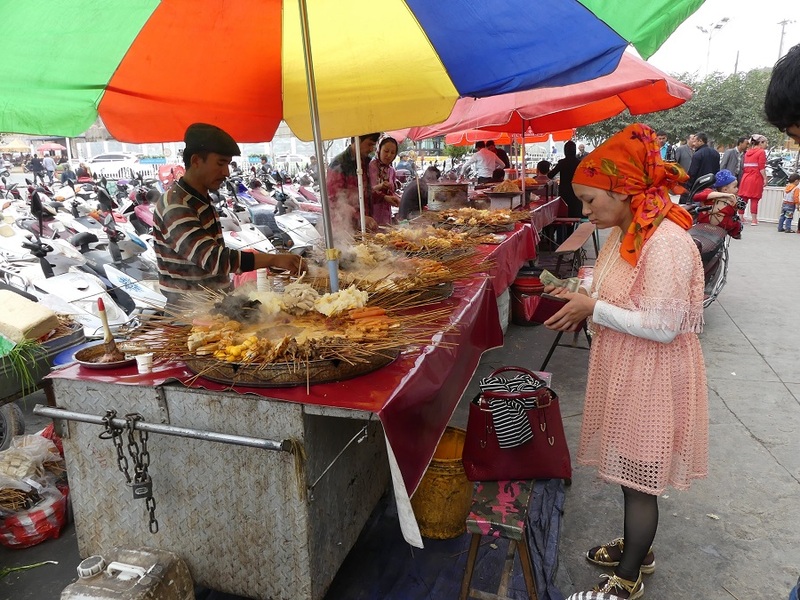 The restaurant serves Tajik and Pakistani food, run by an Uyghur lady named Gulbahaar. 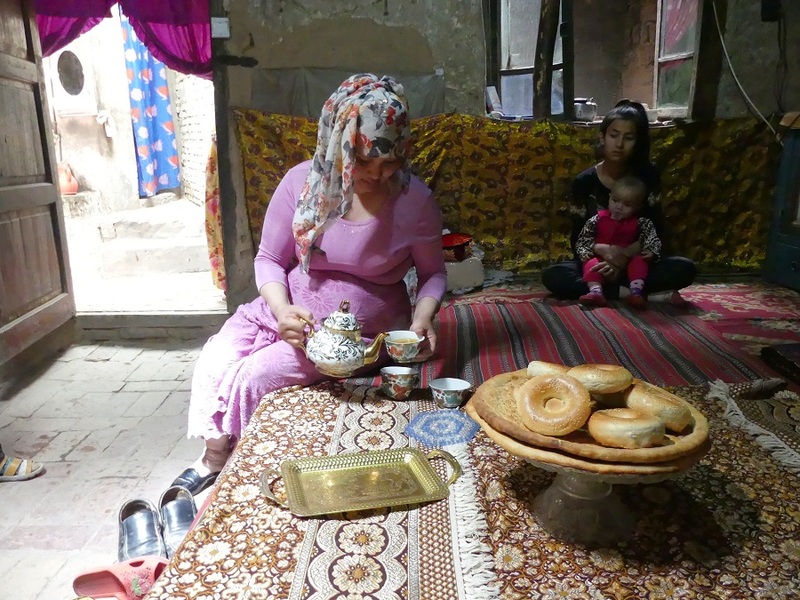 She served us some daal, palak, roti and Tajik tea. The tea was interesting — it came with yak milk, which is milkier, and had salt added instead of sugar. We met some Pakistani’s there, and one Tajik Ismaili, Saddurdin, who spoke some Urdu that we could understand, but not completely. Some things got lost in translation. He hailed from Tashkurgan — which would be our next and final stop in China — and he was going there the next day. 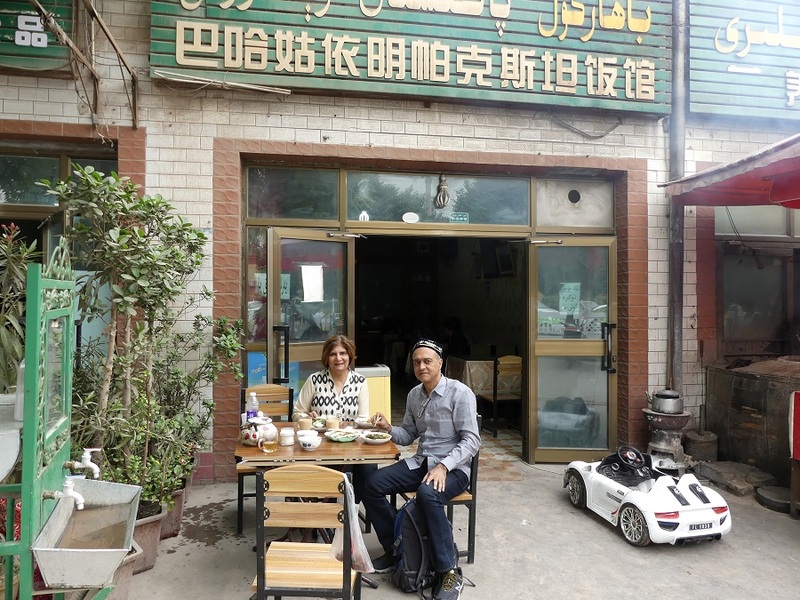 Dilshad and Ali Karim at a Pakistani food restaurant in Kashgar. Photo: Ali Karim. Copyright. Entering Kashgar’s “old” old town. Photo: Ali Karim. Copyright. 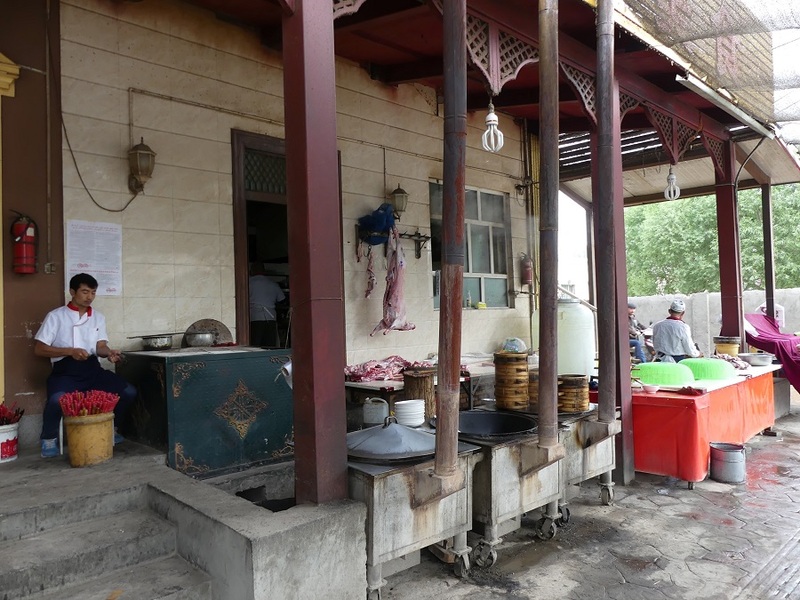 We then went to visit the true old town of Kashgar. This area has many dilapidated houses that have not been touched by the Chinese. 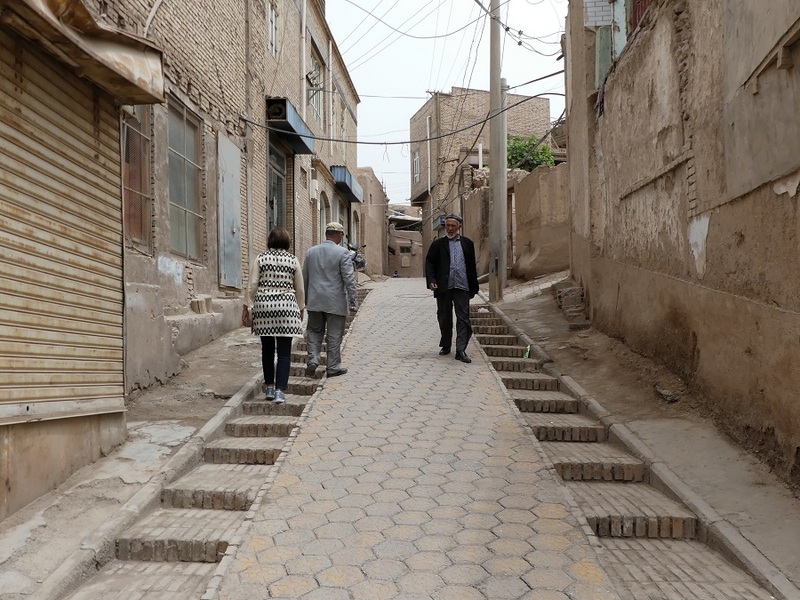 We met locals as we walked along the narrow winding cobblestone streets. 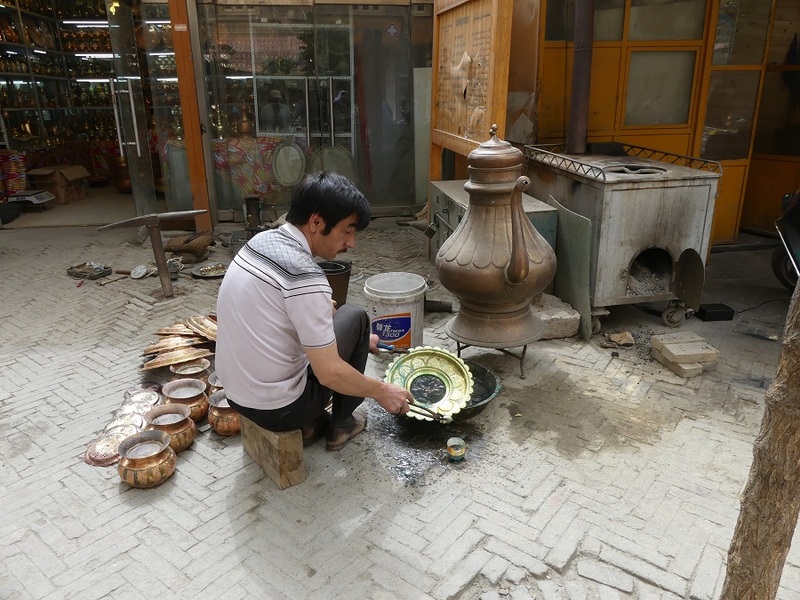 A scene from Kashgar’s old town. Photo: Ali Karim. Copyright. Children in old town Kashgar. Photo: Ali Karim. Copyright. A woman carrying a child with a beautiful colourful cap in old town Kashgar. Photo: Ali Karim. Copyright. 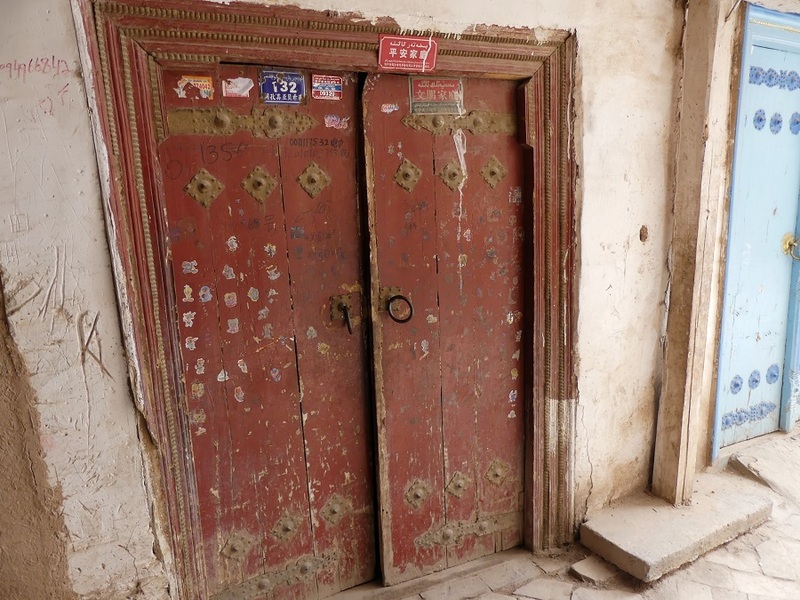 This entrance in old town Kashgar attracted Dilshad to ask to visit this home. Photo: Ali Karim. Copyright. 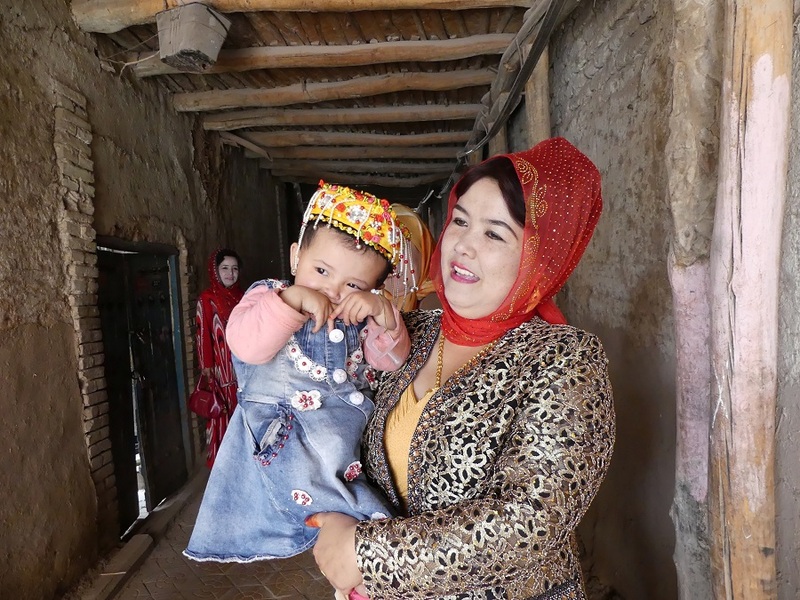 Dilshad spotted a woman in a house making Uyghur hats for women, and asked her if we could visit the next home as it seemed interesting. She simply took us to the neighbor’s house. There were several women there, and a couple of kids, who cordially invited us into their home. It was a very basic home, made of mud adobe and straw, and wood. But it was clean and nice. We sat on the ubiquitous divan, and after some chitchat, via Ablimit, our guide, they brought out a water pot and basin, and we washed our hands 3 times, and dried our hands on a towel. This is Uyghur custom, and it is bad manners to shake the water off your hands since the water may get onto others around you. Then the ladies brought out light black tea with tea leaves and hard bread to eat with tea. After chitchat and more tea, we left their house of what was a wonderful hospitable experience provided to totally uninvited strangers. Dilshad got her hands washed hands 3 times, and had them dried on a towel provided. This is Uyghur custom, and it is bad manners to shake the water off your hands since the water may get onto others around you. Photo: Ali Karim. Copyright. Tea and bread being served by the hostess. Photo: Ali Karim. Copyright. Dilshad clowning with a local shopkeeper. Photo: Ali Karim. Copyright. Local pottery maker with his son. Photo: Ali Karim. Copyright. 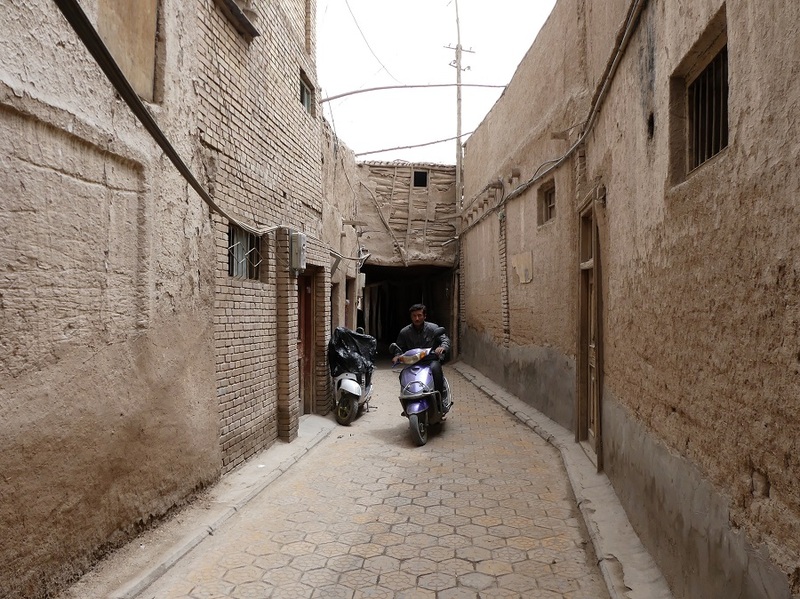 A scooter weaving through a narrow winding street in old Kashgar. Photo: Ali Karim. Copyright. 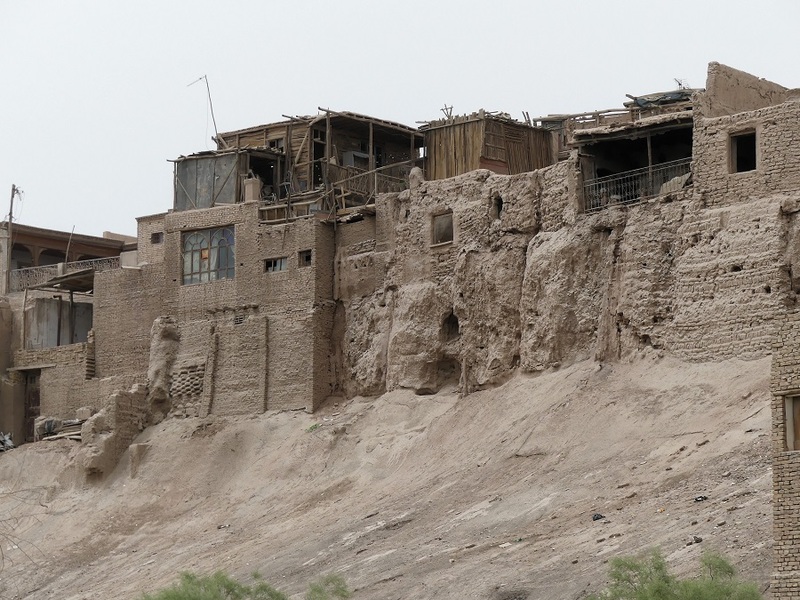 Kashgar’s old town from the outside. Photo: Ali Karim. Copyright. 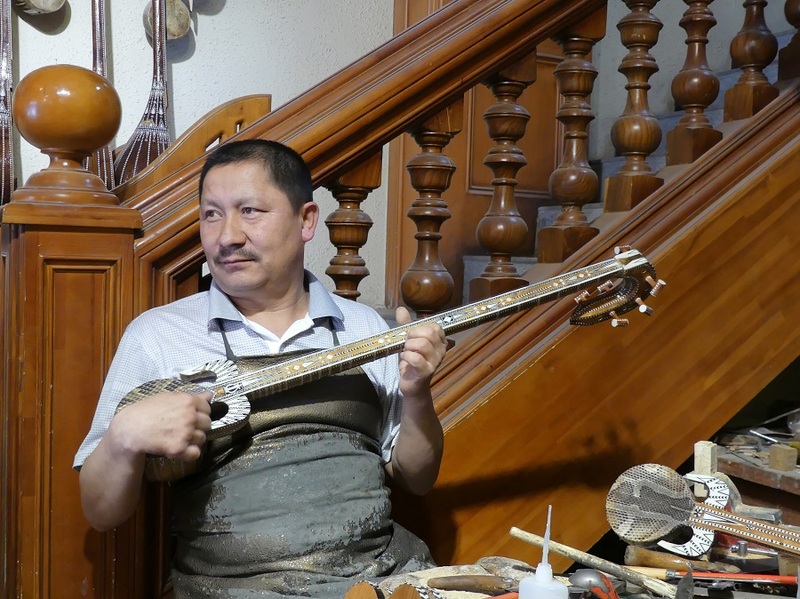 After more old town walking, we went through some local “industries” specializing in metal work and musical instruments, and also paid a visit to a more modern tea house. 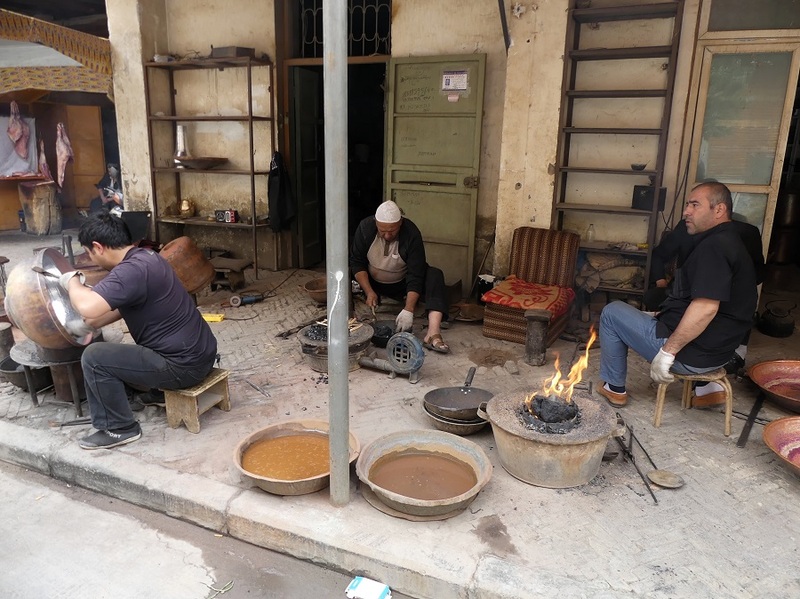 Metalsmiths at work in Kashgar. Photo: Ali Karim. Copyright. Final touches by a metalsmith! Photo: Ali Karim. Copyright. Manufacturing wood steamers. Photo: Ali Karim. Copyright. Store specializing in making musical instruments. Photo: Ali Karim. Copyright. 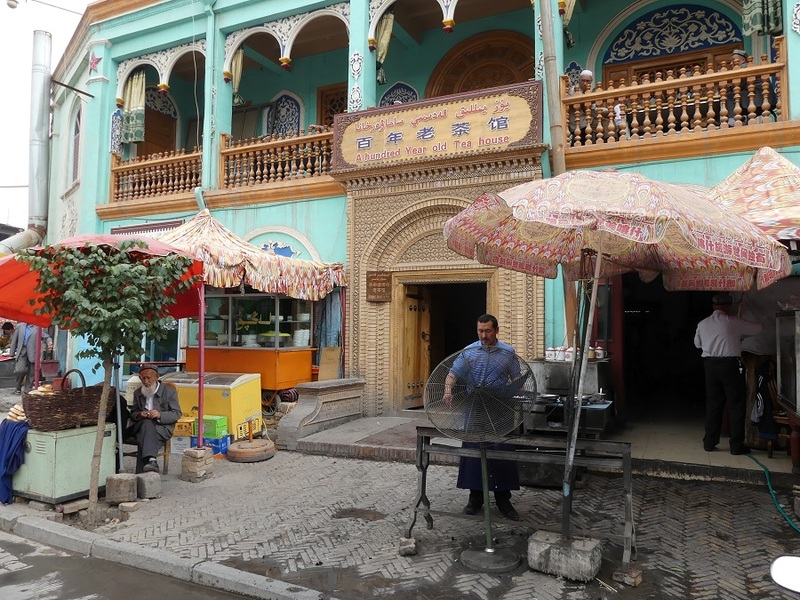 A 100 year old tea house in Kashgar. Photo: Ali Karim. Copyright. Tea house with a patio where clients discuss the day’s events. Photo: Ali Karim. Copyright. Finally, to cap our enthralling visit to Kashdar before our next day’s early morning departure for Tashkurgan, we went to dine at Altun Orda, a popular Uyghur restaurant which was crowded with locals and some some tourists. 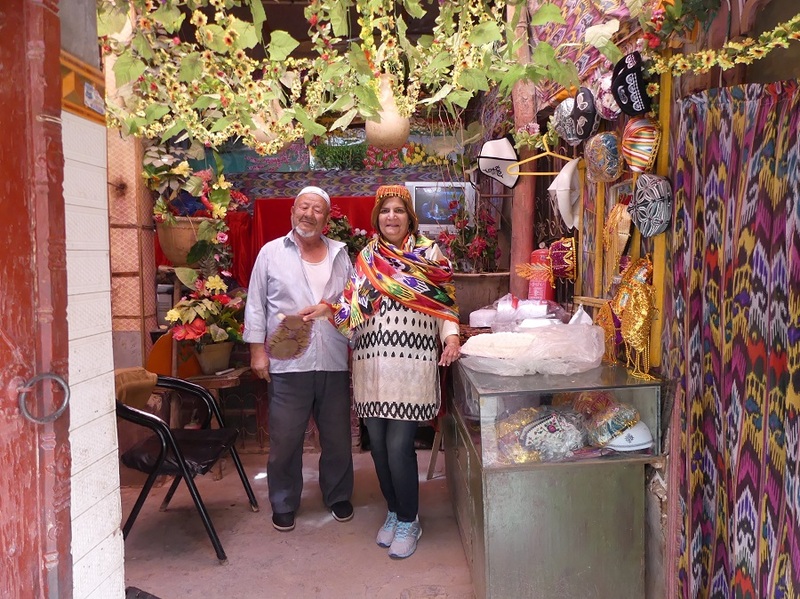 By a happy coincidence, we again met the Goudy’s whom we had first met in Turpan. 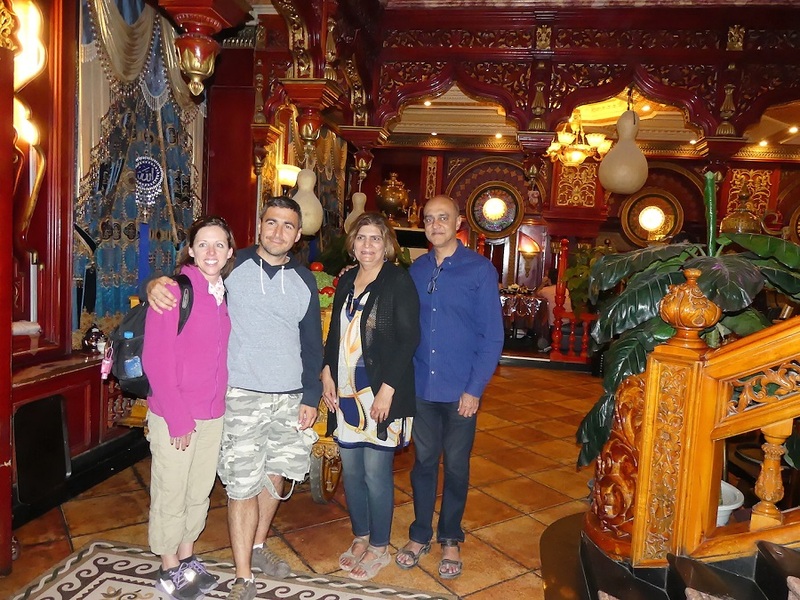 Ali and Dilshad Karim with friends Giulliame and Maggie Goudy whom they first met in Turpan. Photo: Ali Karim. Copyright. We had an enjoyable day, and looked forward to the remainder of our journey that would take us to Tashkurgan, and then past the Khunjerab Pass onto Hunza, all along the scenic Karakorum Highway! 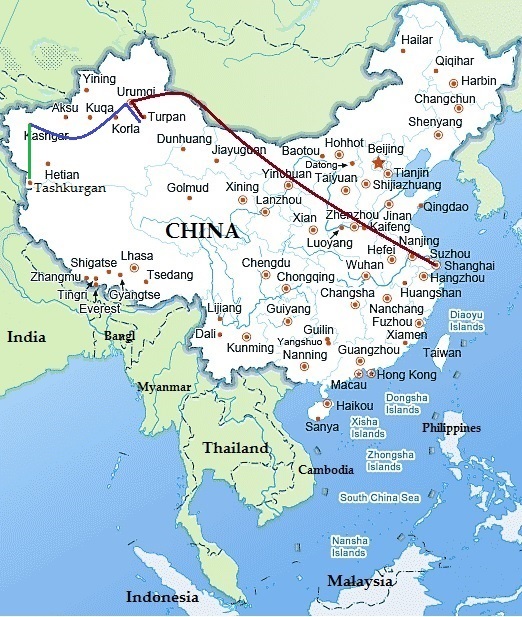 The first and second phases phases of our Silk Road journey – covered in the first two installments of the travelogue – are denoted by the red and blue lines respectively. Briefly, upon our arrival in China, we stayed for a few days in Shangai, and then took a 5-hour flight to Urumqi, in Xinjiang. 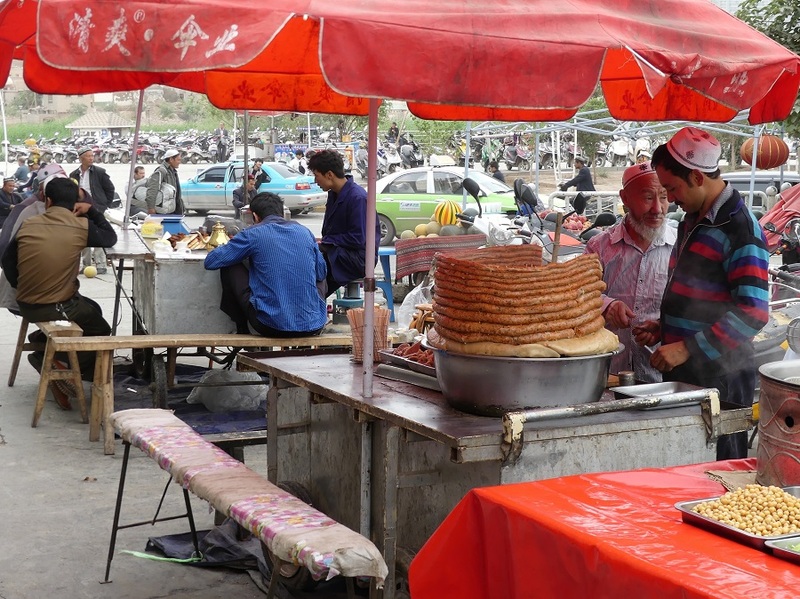 We spent some time in Urumqi and then took a high speed train to Turpan. From Turpan, we travelled back to Urumqi, again on the high speed train, and flew 1400 kms south-west to Kashgar. 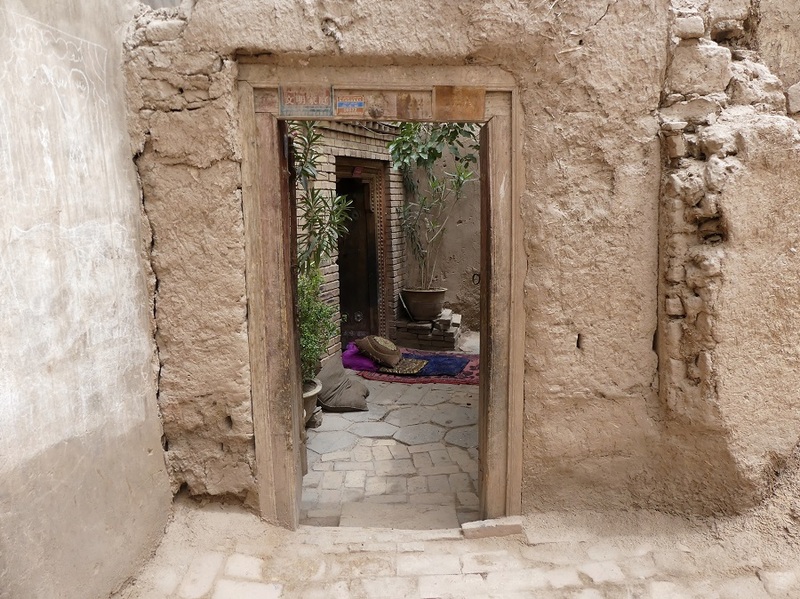 On this page, I have described more sightseeing in Kashgar before we drove 300 kms to Tashkurgan. From an elevation of 4000 ft in Kashgar, we rose to 10,000 ft in Tashkurgan! We left at 7:30 a.m. from Kashgar, to drive to Tashkurgan. Both cities are in Xinjiang province, China. 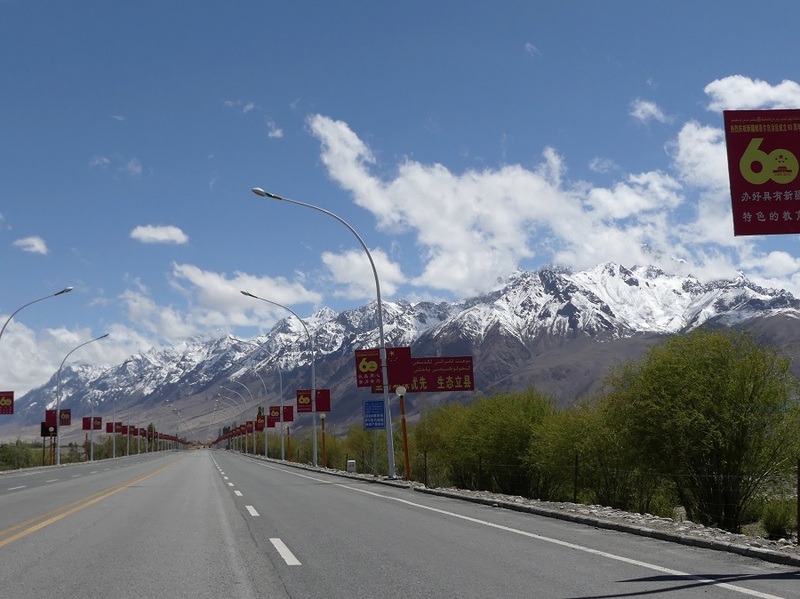 The road from Kashgar to Tashkurgan, and onwards to Islamabad, Pakistan is called the Karakorum Highway (KKH). 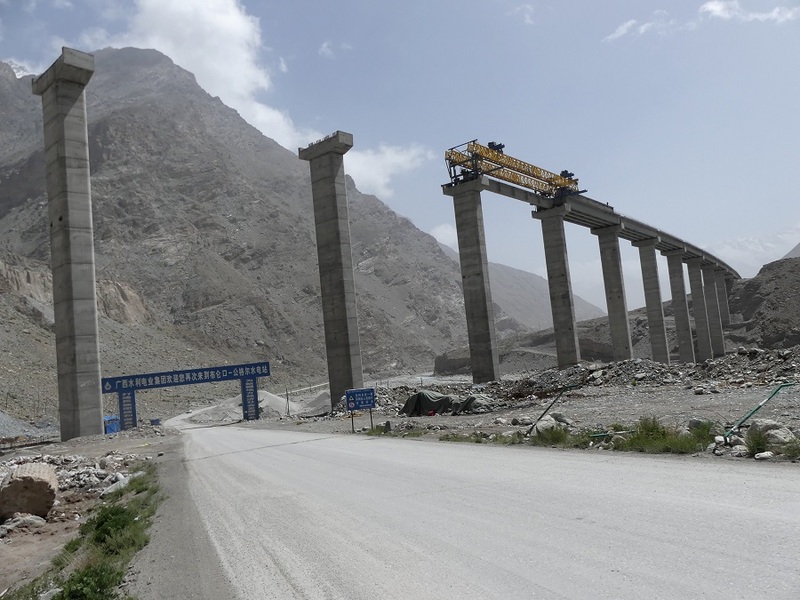 The KKH is supposed to be a very good tarmacked 2 lane road built by the Chinese over high mountain passes, with some stretches still under repair and reconstructions. We were met and driven by Abdul, our guide and his companion. 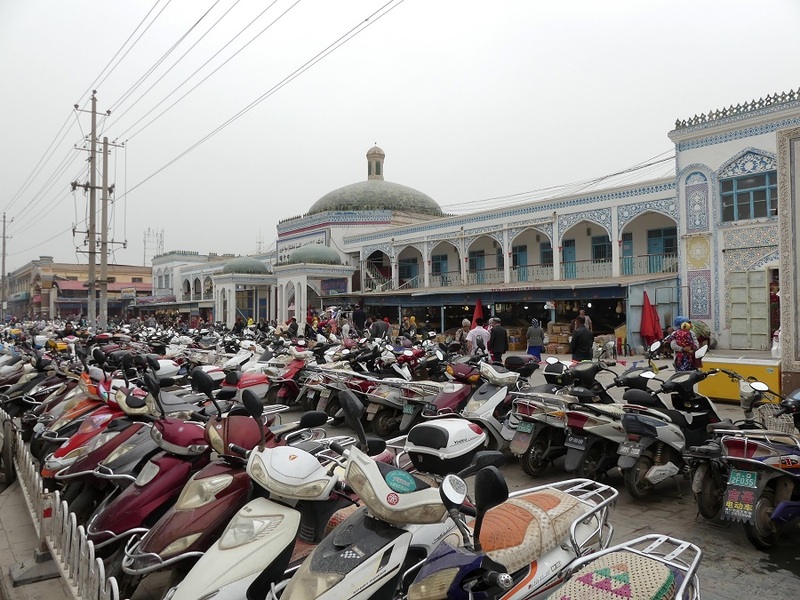 Our first stop was for a gas fill up on the outskirts of Kashgar. The gas station was all fenced in, with barbed wire on top, and a guard at the gate. We were informed that cars could only get gas after 9 a.m. (it was then 8 a.m.), and only trucks were allowed to get gas at this time. Abdul negotiated with the guard, and drove by himself into the gas station, while we waited outside the gas station. Open air kitchen in Opal. Photo: Ali Karim. Copyright. 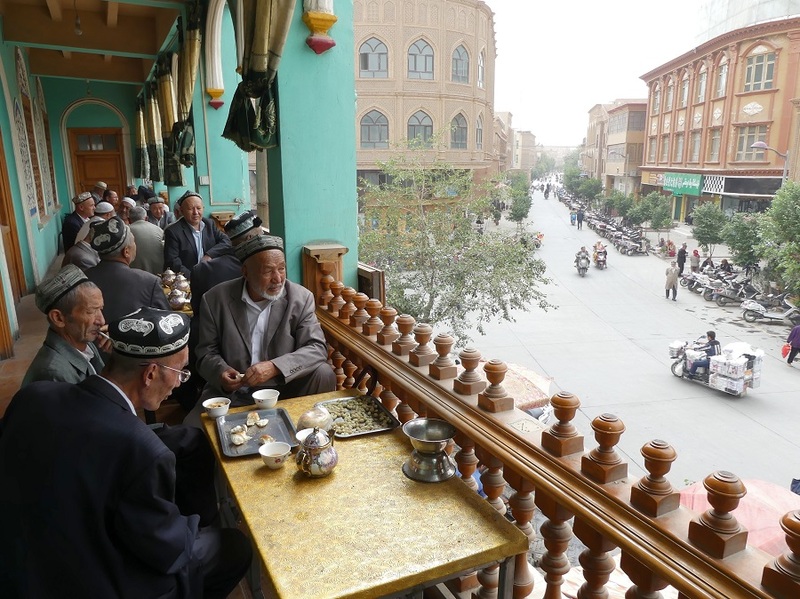 While Kashgar is predominantly Uyghur populated, the population changes along the way, from Uyghur (Kashgar) to Khyrgyz (Karakul area) to Tajik (Tashkurgan to Khunjerab Pass), mostly because of close proximity to these countries. So it is easy from the KKH in this area to drive/crossover into Kyrgyzstan or Tajikistan. Kashgar is at the western end of the Taklamakan desert, which is the world’s 2nd largest sand shifting desert in the world. 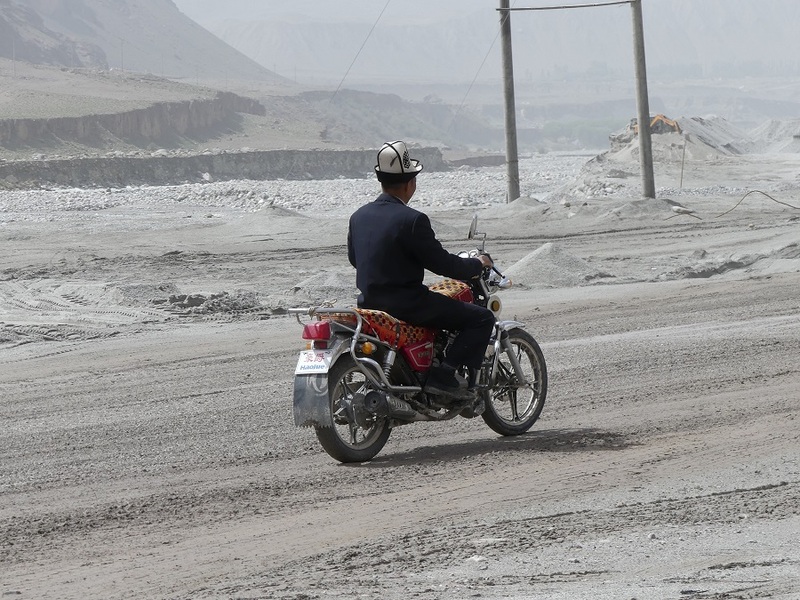 Due to the desert, Kashgar and other oasis towns around the Taklamakan desert have frequent sand storms that stop all transportation for a few days Fortunately for us, the sandstorm had passed a few days earlier! On the KKH, we started climbing from Kashgar (4100ft) slowly to Tashkurgan (10,100ft). We stopped for breakfast at Opal, a small town which is famous for a Monday market; it was Thursday, so missed the market. Breakfast was traditional mutton Polo (pilau) and chai for Abdul and his companion; we just had the chai that came in bowls. Polo (pilau) is a staple meal for breakfast, lunch and dinner! Photo: Ali Karim. Copyright. From Opal onwards, for about 90kms, the road was under construction, so the going was slow and bumpy. It had also rained a couple of days ago, so it was muddy and some mud landslides that had just been cleared. 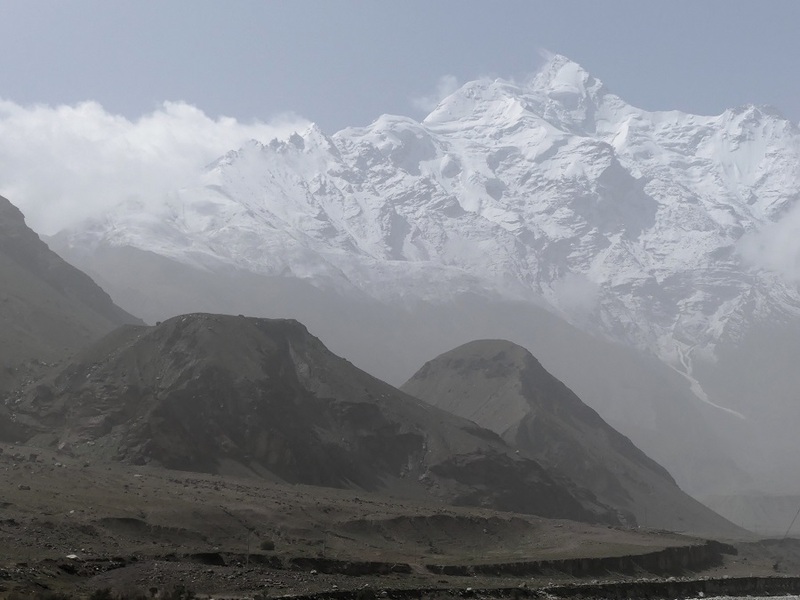 We were now moving into the Karakorum mountain range on our left, and the Pamir range on our right and we saw spectacular scenery with snow capped mountains. The road wound alongside a river with lots of river rock. Khyrgyz man. Photo: Ali Karim. Copyright. 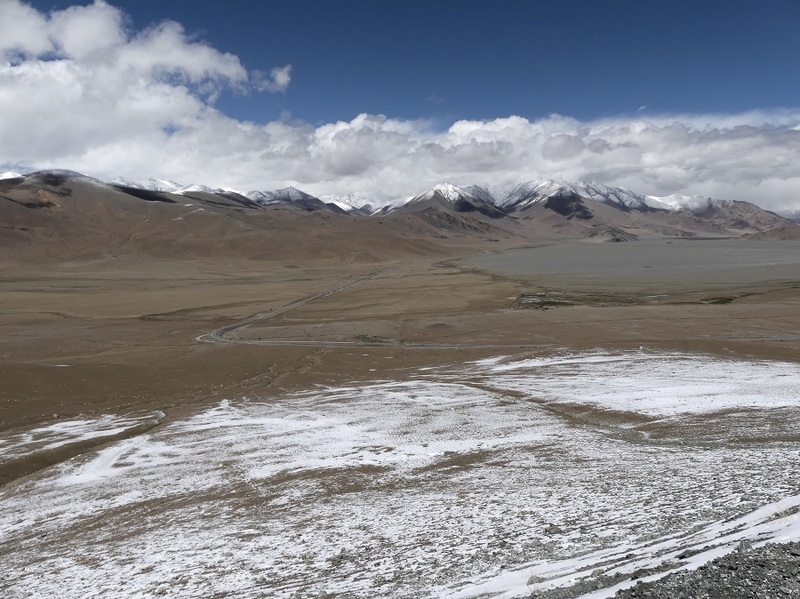 Spectacular mountain scenery of the Pamirs and Karakorum ranges. Photo: Ali Karim. Copyright. At police checkpoints along the way, we had to get out of the car. Photo: Ali Karim. Copyright. There was a lot of construction along the KKH. Photo: Ali Karim. Copyright. Beautiful mountains all around. Photo: Ali Karim. Copyright. We were stopped at a couple of police checkpoints where ID’s had to be shown. Security gets tighter as you get closer to various borders. 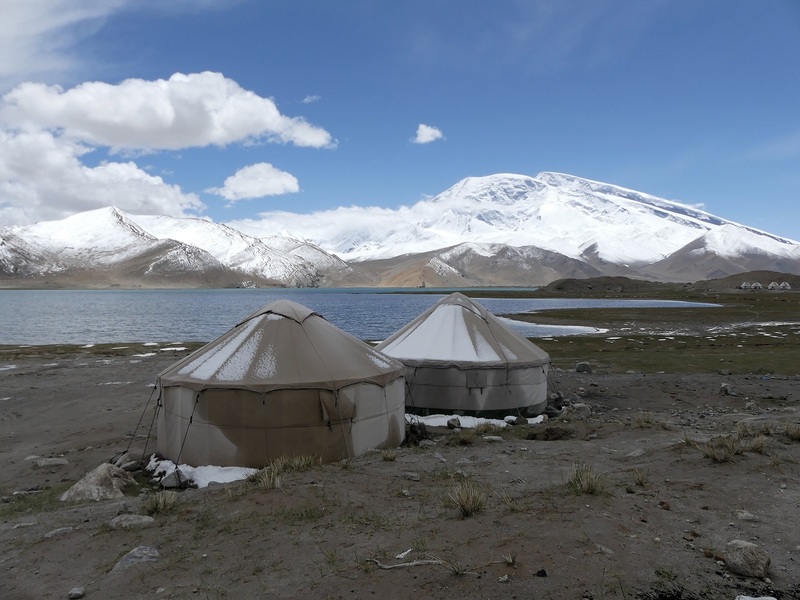 Lake Karakul was the next stop, with Muztagh Ata (7,546 m/24,750 ft), Kongur Tagh (7,649 m/25,088 ft) and Kongur Tiube (7,530 m/24,698 ft) mountains overlooking the lake. There was spectacular scenery all around. Lake Karakul at 12,000ft, is one of the highest lakes on the Pamir plateau, with beautiful scenery. Since we were not hiking around, we did not yet feel the effects of high altitude. Yurts were available for staying in, but the bathrooms were outhouses, and not very sanitary, so we skipped staying in yurts. 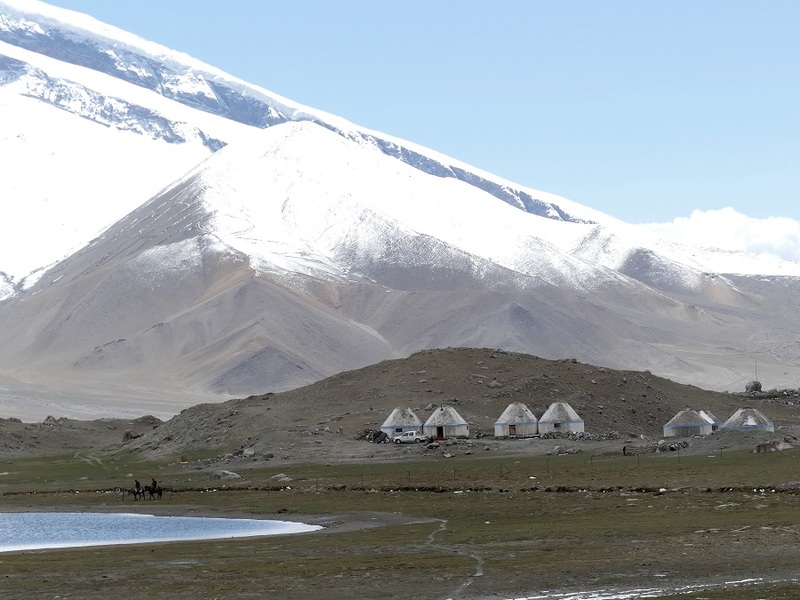 Karakul lake scenery, with yurts in the foreground. Photo: Ali Karim. Copyright. 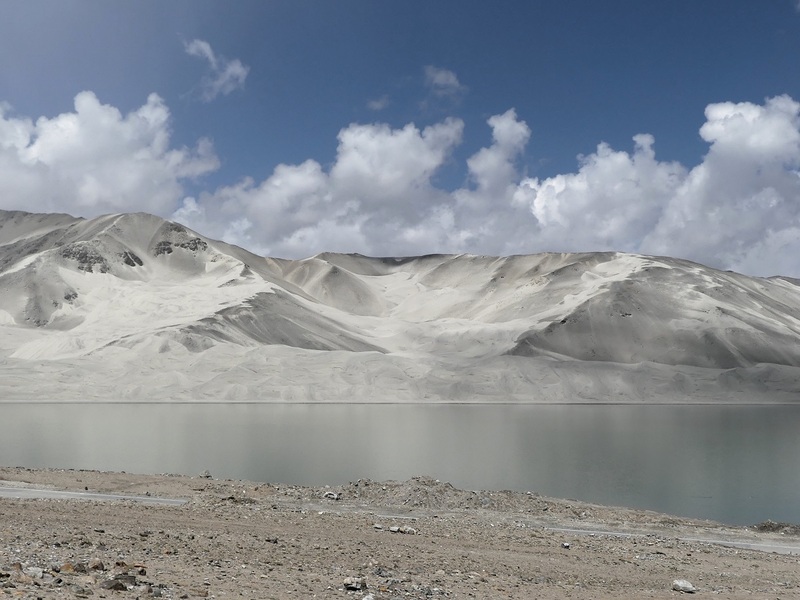 Karakul lake scenery. Photo: Ali Karim. Copyright. Amazing scenery. Photo: Ali Karim. Copyright. 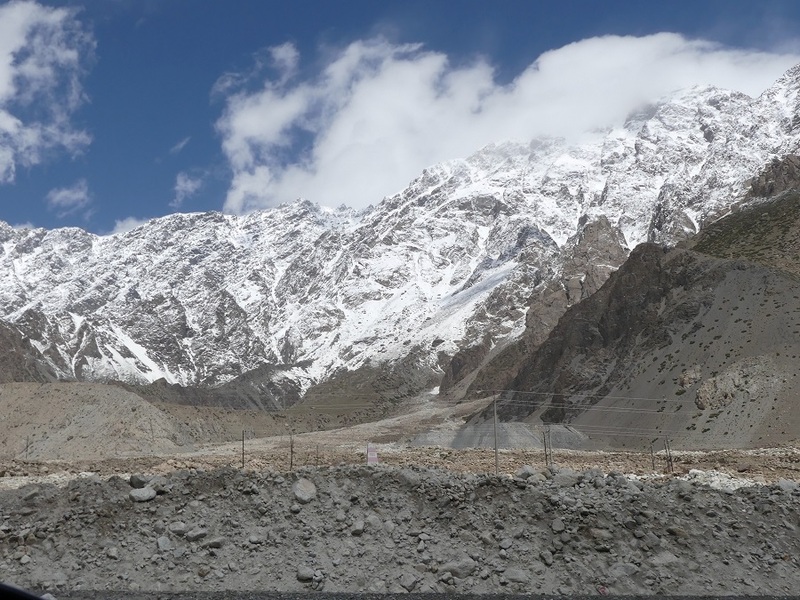 We kept driving to Tashkurgan, with continued spectacular scenery and finally reached Tashkurgan (10,000ft), which is in a valley with snowcapped mountains all around. Entrance to Tashkurgan town. Photo: Ali Karim. Copyright. Date posted: November 14, 2016. COPYRIGHT: This post is copyright by Ali Karim. Reproduction of material and photographs presented here without his prior written consent is strictly prohibited. Forthcoming (November 21, 2016): Part 4 – Tashkurgan and entry into Hunza, Northern Pakistan, via the iconic Khunjerab Pass. We welcome feedback/letters from our readers. Please use the LEAVE A REPLY box which appears below. Please share this travelogue with your friends! To learn more about Ali and Dilshad Karim’s interest in travelling, please click Contributors. Gosh! These are breathtaking sights and such interesting stories. Thank you again for having the generous spirit to take us all along with you. Keep it up! Keep seeing the world! Hi AR, Thanks for the words of encouragement; I want to see as much of the world as possible; there is so much interesting stuff out there :). Stay tuned for Hunza next. Great travelogue and great photography . I have been following your travels with great interest and can’t wait for the travelogue #4. This region is on top of my bucket list. Inshallah soon. Awesome travel info and pics. Wish you all the best in your travel. I am thoroughly enjoying your post on Simergphotos and the beautiful pictures you have captured on your wonderful travel trips around the world. You’re an amazing photographer Ali. Keep up the beautiful work so that the we can experience through your eyes the beautiful natural wonders in this wonderful world. I am enjoying the series so far, and look forward to the remaining parts pertaining to your memorable trip to one of the remotest corners of the world. 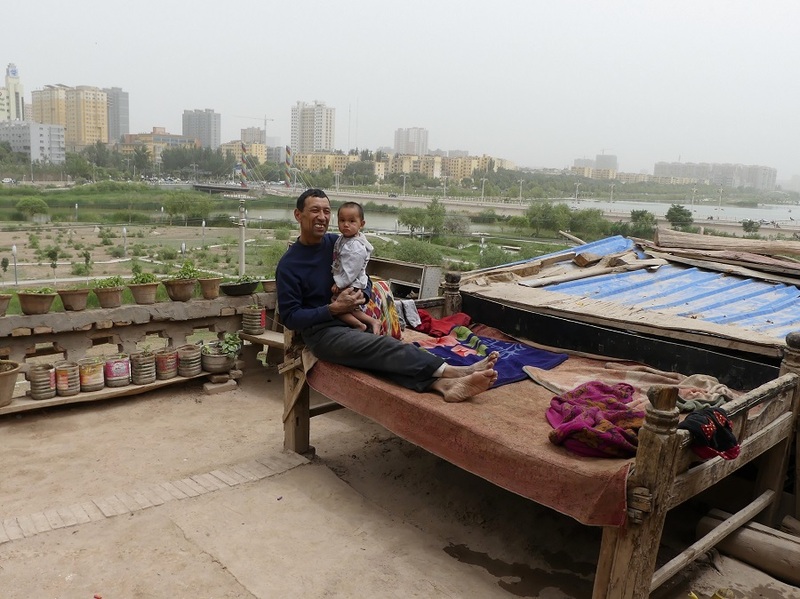 The scenery is incredible, and so are the photographs and information about the life of the Uyghurs in the cities you have covered, namely Urumqi, Turpan and Kashgar. Thank you. Hello Badruddin, So glad that you are enjoying reading our journey and the pictures; as you say, it is a remote area that is off the tourist scene and therefore, much more memorable because of that. Excellent information and knowledge! A truly worthy post. Hi Almas & Firoz; thanks for reading my travelog; so glad you enjoyed it, and thanks for the huge compliment. I really appreciate that. Please stay tuned as we will soon be getting to Hunza and that will be fascinating. PS: MM..Thanks for putting me in touch with AK. AK thank you again for your tips..hope to ask you for more log info as I get more serious about trip.